Just like having an extra set of hands in the kitchen, this 2371 MixMaster stand mixer by Sunbeam makes prep work easier and a lot more fun. Use the stand mixer for anything from day-to-day tasks like making pizza dough for homemade pizzas or mixing pancake batter on the weekends to more ambitious projects like the perfect birthday cake with homemade frosting or high-volume cooking and baking endeavors during the holidays--like colorful holiday cookie recipes or pumpkin pie with freshly whipped cream. The countertop appliance comes equipped with a powerful 350-watt motor and 12 different speed settings for quickly and precisely mixing ingredients to perfection. Fold-knead, stir, blend, mix, cream, whip, and more. The mixer's Soft Start mixing function helps minimize unnecessary splatter and messy flour puff by gently accelerating to the selected speed after start-up. The mixer also provides a burst-of-power function for an extra surge of power as needed to ensure even blending at any speed. The stand mixer comes with three attachments: a pair of chrome beaters for making batter, meat loaf, and all textures in-between; a pair of whisks for egg whites, mayonnaise, creamy salad dressing, and other air-infused creations; and a pair of hooks for mixing and kneading yeast doughs. All three are solidly constructed and easily secured. Even more, the chrome beaters fit the shape of the bowl for maximum coverage, plus they don't have center posts, which makes cleanup a snap by hand or in the dishwasher. Two glass bowls are also included: a 2-quart and a 4-quart bowl--perfect for accommodating small or large quantities. Slide the turntable bowl selector to the left when using the 2-quart bowl or to the right when using the 4-quart bowl. For time-saving convenience, the appliance's head and beaters are off-center from the center of the bowl--this arrangement makes it easy to add ingredients while simultaneously mixing. Each beater rotates independently of one another while the free-spinning mixing bowl rotates automatically. This synchronized three-way mixing action swirls ingredients into the perfect consistency. Additional highlights include a large turn dial for setting the speed, an on/off and speed indicator light, a head that tilts back and locks into place for easy bowl access, and a button for simple attachment removal, as well as an ergonomically designed soft-grip handle for maximum comfort when lifting and lowering the head. 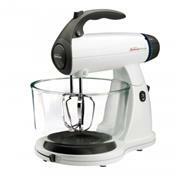 The stand mixer, with its clean white housing and grey accents, nicely accommodates surrounding decor. Store it in a cupboard or cabinet in between use, or leave it out on the counter for easy access. Weighing about 17-1/2 pounds, the MixMaster stand mixer measures approximately 13-3/5 inches long by 12 inches wide by 14-4/5 inches high.